This week we have been using Cotton True Sport by Fibra Natura to knit a lace pattern that has traveling repeats. In previous posts we looked at the elements of increases and decreases. Today, those elements come together. 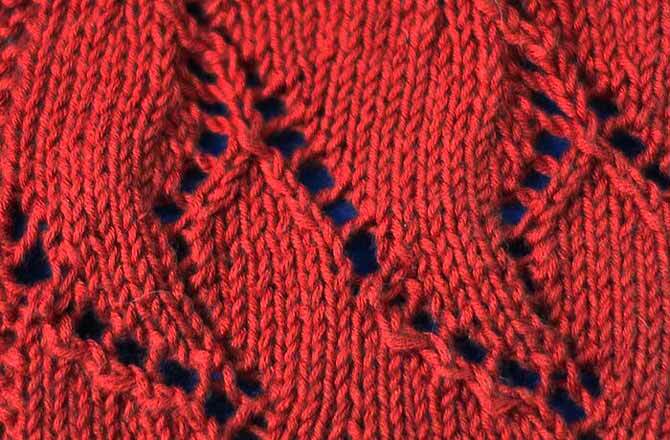 If you normally knit from lace charts, you’ll be familiar with the red or blue rectangles or boxes that are drawn around a series of stitches and a set of rows to indicate the repeats of the lace motif you’re knitting. If you normally knit from text instructions, you’ll be familiar with the asterisks or square brackets or other symbols which tell you what series of stitches to repeat and with instructions such as “repeat rows 3-17 three times” give you the row repeats. When it comes to traveling lace stitch patterns however, these conventions change a little. This tutorial will review the characteristics of traveling lace knitting stitch patterns and give you a few tips on how to use these amazing patterns in your handknits. What are traveling lace stitch patterns? Traveling lace stitch patterns are basically stitch patterns which have a diagonal bias built into them. They tend to be used over wider expanses of knit fabric in an all over pattern which makes the motifs appear to travel diagonally across the fabric. In the above photo, the 2 triangle peaks that are formed by the eyelets and the paired decreases are actually not parallel to each other. The tip of one triangle is 2 rows higher than the other if you could see this in a charted stitch diagram. Diagonal bias patterns are more common in woven fabric than in handknits. Weaves such as twill and its variations like herringbone and hounds-tooth are quite common. Crows-foot satin and Dutch twill are other weaves that produce a diagonal appearance to color or other motifs in the fabric. Because the lace motifs don’t stay in a straight line across the rows of handknit fabric, I call this traveling lace. As you can see in the above chart, there’s a jog in the pattern repeat box. This is the easiest way to visualize traveling lace stitch patterns. If you look at the the diagonal line of yarn-over and decrease symbols and then you look for the same repeat of this diagonal formation above it, you’ll notice that the line is shifted over. In this close-up of the chart it’s possible to see how the motif travels to the right to form a diagonal bias. In the next close-up, you can see how the whole pattern repeat also has a row shift in it part way across the motif. To read this traveling lace stitch pattern chart, you let your eye travel across the colored lines from the bottom right corner to the left; at the jog in the diagram, your eyes should jump up and a little to the left and you continue knitting across to the end of the motif repeat, then your eye returns to the bottom right line of the same color and you proceed across again (start with the light green line). You’re not working short rows. The stitches on the needle are all on the same row, it’s how your eyes follow the chart that changes. This particular motif has lace work on the wrong side (WS) rows as well, so the WS rows are not just plain purl across. To work a WS row, start at the side of the repeat at the colored line of the WS row (the lavender pink one above the light green one) and read the chart to the right, dropping your eyes at the jog to the lower row of stitch symbols in the same color. Continue to the right and at the end of the repeat return your eyes to the left of the diagram. 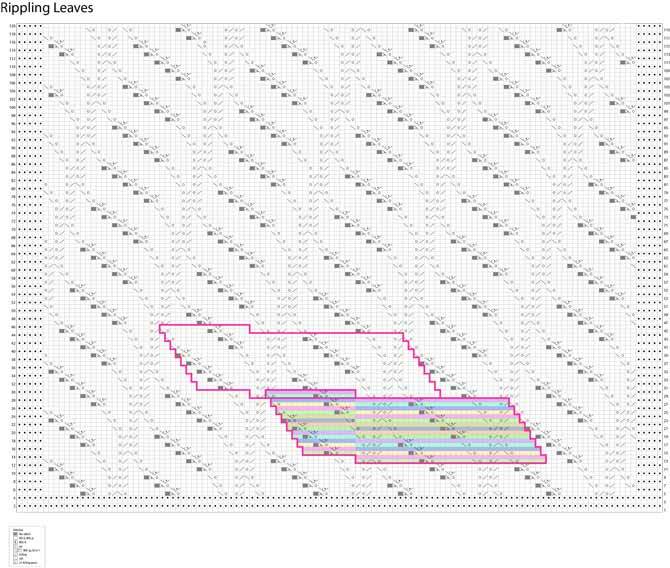 I swatched this traveling leaf lace chart above several times but couldn’t get it to work the way I wanted, so I searched out a similar one. As luck would have it, the new pattern looks less like leaves and more like the ripples made on a beach from the waves and tide, which I think is even prettier! I hope that you try this lace pattern on a project like a baby blanket or a stole. It’s a multiple of 46 stitches, so if you want it wider, cast on 122 stitches to follow the chart below exactly. I’m including the text instructions for this pattern, but unfortunately, traveling lace stitch patterns don’t work well in text instructions because the jog can’t be explained with words or asterisks and row repeats. At the start of each motif, the repeat is off by 2 stitches. As a result, it would take hundreds of rows for the diagonal pattern to completely move across the fabric and get back to the beginning. I have, however, included the text instructions for the first 52 rows. Cotton True Sport yarn would be a perfect yarn to make a receiving blanket or a wedding stole using this stitch pattern. I hope you give it a try. Row 5: K9, [k2tog, yo] twice, k6, yo, s1-k2tog-psso, k8, yo, ssk, k1, k2tog, yo, k2, yo, ssk, k8, yo, s1-k2tog-psso, k5, [k2tog, yo] twice, k4, yo, s1-k2tog-psso, k9, yo, ssk, k2, k2tog, yo, k1, yo, ssk, k7, yo, s1-k2tog-psso, k7, yo, ssk, k2tog, yo, k2, yo, s1-k2tog-psso, k12 (117 sts). Row 6: K5, p8, (p, k) in 1, [p14, (p, k) in 1, p26, (p, k) in 1] twice, p14, k5 (122 sts). Row 7: K5, yo, ssk, k2, k2tog, yo, k1, yo, ssk, k7, yo, s1-k2tog-psso, k7, yo, ssk, k2tog, yo, k3, yo, ssk, k9, yo, s1-k2tog-psso, k3, [k2tog, yo] twice, k6, yo, s1-k2tog-psso, k8, yo, ssk, k1, k2tog, yo, k2, yo, ssk, k8, yo, s1-k2tog-psso, k5, [k2tog, yo] twice, k4, yo, s1-k2tog-psso, k10 (117 sts). Row 8: K5, p6, (p, k) in 1, [p14, (p, k) in 1, p26, (p, k) in 1] twice, p16, k5 (122 sts). Row 9: K6, yo, ssk, k1, k2tog, yo, k2, yo, ssk, k8, yo, s1-k2tog-psso, k5, [k2tog, yo] twice, k4, yo, s1-k2tog-psso, k9, yo, ssk, k2, k2tog, yo, k1, yo, ssk, k7, yo, s1-k2tog-psso, k7, yo, ssk, k2tog, yo, k3, yo, ssk, k9, yo, s1-k2tog-psso, k3, [k2tog, yo] twice, k6, yo, s1-k2tog-psso, k8 (117 sts). Row 10: K5, p4, (p, k) in 1, [p14, (p, k) in 1, p12] 3 times, p2, (p, k) in 1, p18, k5 (122 sts). Row 11: K7, yo, ssk, k2tog, yo, k3, yo, ssk, k9, yo, s1-k2tog-psso, k3, [k2tog, yo] twice, k6, yo, s1-k2tog-psso, k8, yo, ssk, k1, k2tog, yo, k2, yo, ssk, k8, yo, s1-k2tog-psso, k5, [k2tog, yo] twice, k4, yo, s1-k2tog-psso, k9, yo, ssk, k2, k2tog, yo, k1, yo, ssk, k7, yo, s1-k2tog-psso, k6 (117 sts). Row 12: K5, p2, (p, k) in 1, [p12, [p14, (p, k) in 1] twice] twice, p20, k5 (122 sts). Row 13: K7, [k2tog, yo] twice, k4, yo, s1-k2tog-psso, k9, yo, ssk, k2, k2tog, yo, k1, yo, ssk, k7, yo, s1-k2tog-psso, k7, yo, ssk, k2tog, yo, k3, yo, ssk, k9, yo, s1-k2tog-psso, k3, [k2tog, yo] twice, k6, yo, s1-k2tog-psso, k8, yo, ssk, k1, k2tog, yo, k2, yo, ssk, k8, yo, ssk, k5 (118 sts). Row 14: K5, p17, [p11, (p, k) in 1, p3] twice, [p23, (p, k) in 1, p3] twice, p7, k5 (122 sts). Row 15: K7, [k2tog, yo] twice, k6, yo, s1-k2tog-psso, k8, yo, ssk, k1, k2tog, yo, k2, yo, ssk, k8, yo, s1-k2tog-psso, k5, [k2tog, yo] twice, k4, yo, s1-k2tog-psso, k9, yo, ssk, k2, k2tog, yo, k1, yo, ssk, k7, yo, s1-k2tog-psso, k7, yo, ssk, k2tog, yo, k3, yo, ssk, k14 (118 sts). Row 16: K5, p12, [p14, (p, k) in 1, p26, (p, k) in 1] twice, p12, k5 (122 sts). Row 17: K7, k2tog, yo, k1, yo, ssk, k7, yo, s1-k2tog-psso, k7, yo, ssk, k2tog, yo, k3, yo, ssk, k9, yo, s1-k2tog-psso, k3, [k2tog, yo] twice, k6, yo, s1-k2tog-psso, k8, yo, ssk, k1, k2tog, yo, k2, yo, ssk, k8, yo, s1-k2tog-psso, k5, [k2tog, yo] twice, k4, yo, s1-k2tog-psso, k12 (117 sts). Row 18: K5, p8, (p, k) in 1, [p14, (p, k) in 1, p26, (p, k) in 1] twice, p14, k5 (122 sts). Row 19: K5, ssk, k1, k2tog, yo, k2, yo, ssk, k8, yo, s1-k2tog-psso, k5, [k2tog, yo] twice, k4, yo, s1-k2tog-psso, k9, yo, ssk, k2, k2tog, yo, k1, yo, ssk, k7, yo, s1-k2tog-psso, k7, yo, ssk, k2tog, yo, k3, yo, ssk, k9, yo, s1-k2tog-psso, k3, [k2tog, yo] twice, k6, yo, s1-k2tog-psso, k10 (117 sts). Row 20: K5, p6, (p, k) in 1, [p14, (p, k) in 1, p12] 3 times, p2, (p, k) in 1, p16, k5 (122 sts). Row 21: K5, yo, ssk, k2tog, yo, k3, yo, ssk, k9, yo, s1-k2tog-psso, k3, [k2tog, yo] twice, k6, yo, s1-k2tog-psso, k8, yo, ssk, k1, k2tog, yo, k2, yo, ssk, k8, yo, s1-k2tog-psso, k5, [k2tog, yo] twice, k4, yo, s1-k2tog-psso, k9, yo, ssk, k2, k2tog, yo, k1, yo, ssk, k7, yo, s1-k2tog-psso, k8 (117 sts). Row 22: K5, p4, (p, k) in 1, [p12, [p14, (p, k) in 1] twice] twice, p18, k5 (122 sts). Row 23: K5, [k2tog, yo] twice, k4, yo, s1-k2tog-psso, k9, yo, ssk, k2, k2tog, yo, k1, yo, ssk, k7, yo, s1-k2tog-psso, k7, yo, ssk, k2tog, yo, k3, yo, ssk, k9, yo, s1-k2tog-psso, k3, [k2tog, yo] twice, k6, yo, s1-k2tog-psso, k8, yo, ssk, k1, k2tog, yo, k2, yo, ssk, k8, yo, s1-k2tog-psso, k6 (117 sts). Row 24: K5, [p2, (p, k) in 1, p26, (p, k) in 1, p12] twice, p14, (p, k) in 1, p8, k5 (122 sts). Row 25: K5, [k2tog, yo] twice, k6, yo, s1-k2tog-psso, k8, yo, ssk, k1, k2tog, yo, k2, yo, ssk, k8, yo, s1-k2tog-psso, k5, [k2tog, yo] twice, k4, yo, s1-k2tog-psso, k9, yo, ssk, k2, k2tog, yo, k1, yo, ssk, k7, yo, s1-k2tog-psso, k7, yo, ssk, k2tog, yo, k3, yo, ssk, k9, yo, ssk, k5 (118 sts). Row 26: K5, p14, [p14, (p, k) in 1, p26, (p, k) in 1] twice, p10, k5 (122 sts). Row 27: K5, k2tog, yo, k1, yo, ssk, k7, yo, s1-k2tog-psso, k7, yo, ssk, k2tog, yo, k3, yo, ssk, k9, yo, s1-k2tog-psso, k3, [k2tog, yo] twice, k6, yo, s1-k2tog-psso, k8, yo, ssk, k1, k2tog, yo, k2, yo, ssk, k8, yo, s1-k2tog-psso, k5, [k2tog, yo] twice, k4, yo, s1-k2tog-psso, k14 (117 sts). Row 28: K5, [[p10, (p, k) in 1, p4] twice, p12] twice, p10, (p, k) in 1, p12, k5 (122 sts). Row 29: K5, k2tog, yo, k2, yo, ssk, k8, yo, s1-k2tog-psso, k5, [k2tog, yo] twice, k4, yo, s1-k2tog-psso, k9, yo, ssk, k2, k2tog, yo, k1, yo, ssk, k7, yo, s1-k2tog-psso, k7, yo, ssk, k2tog, yo, k3, yo, ssk, k9, yo, s1-k2tog-psso, k3, [k2tog, yo] twice, k6, yo, s1-k2tog-psso, k12 (117 sts). Row 30: K5, p8, (p, k) in 1, [p14, (p, k) in 1, p12] 3 times, p2, (p, k) in 1, p14, k5 (122 sts). Row 31: K5, k2tog, yo, k3, yo, ssk, k9, yo, s1-k2tog-psso, k3, [k2tog, yo] twice, k6, yo, s1-k2tog-psso, k8, yo, ssk, k1, k2tog, yo, k2, yo, ssk, k8, yo, s1-k2tog-psso, k5, [k2tog, yo] twice, k4, yo, s1-k2tog-psso, k9, yo, ssk, k2, k2tog, yo, k1, yo, ssk, k7, yo, s1-k2tog-psso, k10 (117 sts). Row 32: K5, p6, (p, k) in 1, [p12, [p14, (p, k) in 1] twice] twice, p16, k5 (122 sts). Row 33: K5, k2tog, yo, k4, yo, s1-k2tog-psso, k9, yo, ssk, k2, k2tog, yo, k1, yo, ssk, k7, yo, s1-k2tog-psso, k7, yo, ssk, k2tog, yo, k3, yo, ssk, k9, yo, s1-k2tog-psso, k3, [k2tog, yo] twice, k6, yo, s1-k2tog-psso, k8, yo, ssk, k1, k2tog, yo, k2, yo, ssk, k8, yo, s1-k2tog-psso, k8 (117 sts). Row 34: K5, [p4, (p, k) in 1, p26, (p, k) in 1, p10] twice, p16, (p, k) in 1, p6, k5 (122 sts). Row 35: K5, k2tog, yo, k6, yo, s1-k2tog-psso, k8, yo, ssk, k1, k2tog, yo, k2, yo, ssk, k8, yo, s1-k2tog-psso, k5, [k2tog, yo] twice, k4, yo, s1-k2tog-psso, k9, yo, ssk, k2, k2tog, yo, k1, yo, ssk, k7, yo, s1-k2tog-psso, k7, yo, ssk, k2tog, yo, k3, yo, ssk, k9, yo, s1-k2tog-psso, k6 (117 sts). Row 36: K5, p2, (p, k) in 1, p12, [p14, (p, k) in 1, p26, (p, k) in 1] twice, p8, k5 (122 sts). Row 37: K6, yo, ssk, k7, yo, s1-k2tog-psso, k7, yo, ssk, k2tog, yo, k3, yo, ssk, k9, yo, s1-k2tog-psso, k3, [k2tog, yo] twice, k6, yo, s1-k2tog-psso, k8, yo, ssk, k1, k2tog, yo, k2, yo, ssk, k8, yo, s1-k2tog-psso, k5, [k2tog, yo] twice, k4, yo, s1-k2tog-psso, k9, yo, ssk, k5 (117 sts). Row 38: K5, [[p12, (p, k) in 1, p2] twice, p12] twice, p10, (p, k) in 1, p10, k5 (120 sts). Row 39: K7, yo, ssk, k8, yo, s1-k2tog-psso, k5, [k2tog, yo] twice, k4, yo, s1-k2tog-psso, k9, yo, ssk, k2, k2tog, yo, k1, yo, ssk, k7, yo, s1-k2tog-psso, k7, yo, ssk, k2tog, yo, k3, yo, ssk, k9, yo, s1-k2tog-psso, k3, [k2tog, yo] twice, k6, yo, s1-k2tog-psso, k8, yo, k5 (117 sts). Row 40: K5, p10, (p, k) in 1, [p14, (p, k) in 1, p12] 3 times, p1, (p, k) in 1, p12, k5 (121 sts). Row 41: K8, yo, ssk, k8, yo, s1-k2tog-psso, k3, [k2tog, yo] twice, k6, yo, s1-k2tog-psso, k8, yo, ssk, k1, k2tog, yo, k2, yo, ssk, k8, yo, s1-k2tog-psso, k5, [k2tog, yo] twice, k4, yo, s1-k2tog-psso, k9, yo, ssk, k2, k2tog, yo, k1, yo, ssk, k7, yo, s1-k2tog-psso, k12 (116 sts). Row 42: K5, p8, (p, k) in 1, [p12, [p14, (p, k) in 1] twice] twice, p13, k5 (121 sts). Row 43: K9, yo, s1-k2tog-psso, k9, yo, ssk, k2, k2tog, yo, k1, yo, ssk, k7, yo, s1-k2tog-psso, k7, yo, ssk, k2tog, yo, k3, yo, ssk, k9, yo, s1-k2tog-psso, k3, [k2tog, yo] twice, k6, yo, s1-k2tog-psso, k8, yo, ssk, k1, k2tog, yo, k2, yo, ssk, k8, yo, s1-k2tog-psso, k10 (117 sts). Row 44: K5, p6, (p, k) in 1, p26, (p, k) in 1, [p14, (p, k) in 1, p10] twice, p16, (p, k) in 1, p4, k5 (120 sts). Row 45: K11, yo, s1-k2tog-psso, k8, yo, ssk, k1, k2tog, yo, k2, yo, ssk, k8, yo, s1-k2tog-psso, k5, [k2tog, yo] twice, k4, yo, s1-k2tog-psso, k9, yo, ssk, k2, k2tog, yo, k1, yo, ssk, k7, yo, s1-k2tog-psso, k7, yo, ssk, k2tog, yo, k3, yo, ssk, k9, yo, s1-k2tog-psso, k8 (117 sts). Row 46: K5, p4, (p, k) in 1, p13, [p13, (p, k) in 1, p26, (p, k) in 1] twice, p6, k5 (121 sts). Row 47: K5, ssk, k7, yo, s1-k2tog-psso, k7, yo, ssk, k2tog, yo, k3, yo, ssk, k9, yo, s1-k2tog-psso, k3, [k2tog, yo] twice, k6, yo, s1-k2tog-psso, k8, yo, ssk, k1, k2tog, yo, k2, yo, ssk, k8, yo, s1-k2tog-psso, k5, [k2tog, yo] twice, k4, yo, s1-k2tog-psso, k9, yo, ssk, k7 (117 sts). Row 48: K5, [[p14, (p, k) in 1] twice, p12] twice, p14, (p, k) in 1, p8, k5 (122 sts). Row 49: K5, yo, ssk, k8, yo, s1-k2tog-psso, k5, [k2tog, yo] twice, k4, yo, s1-k2tog-psso, k9, yo, ssk, k2, k2tog, yo, k1, yo, ssk, k7, yo, s1-k2tog-psso, k7, yo, ssk, k2tog, yo, k3, yo, ssk, k9, yo, s1-k2tog-psso, k3, [k2tog, yo] twice, k6, yo, s1-k2tog-psso, k8, yo, ssk, k6 (117 sts). Row 50: K5, p12, (p, k) in 1, [p14, (p, k) in 1, p12] 3 times, p2, (p, k) in 1, p10, k5 (122 sts). Row 51: K6, yo, ssk, k9, yo, s1-k2tog-psso, k3, [k2tog, yo] twice, k6, yo, s1-k2tog-psso, k8, yo, ssk, k1, k2tog, yo, k2, yo, ssk, k8, yo, s1-k2tog-psso, k5, [k2tog, yo] twice, k4, yo, s1-k2tog-psso, k9, yo, ssk, k2, k2tog, yo, k1, yo, ssk, k7, yo, s1-k2tog-psso, k7, yo, ssk, k5 (117 sts). Row 52: K5, p10, (p, k) in 1, [p12, [p14, (p, k) in 1] twice] twice, p12, k5 (122 sts).